Grain might feed the world, but it has always been a predominantly bulk business and hasn't fed into the global breakbulk and project cargo industries in big way. That might be changing, as new grain-related project cargoes emerge riding the coattails of record global grain production and a billion-gallon increase in global grain ethanol production last year. In October, the U.S. Department of Agriculture released its Grain: World Markets and Trade 2016/2017 outlook, projecting that U.S. and global wheat, rice and corn production will set records. Moreover, according to the U.S. Energy Information Administration's U.S. Fuel Ethanol Plant Production Capacity report released in June 2016, U.S. ethanol plant capacity has increased for the third consecutive year. America is home to almost 200 ethanol plants that offer up 15 billion gallons of nameplate capacity, the volume of denatured fuel ethanol that can be produced during the year under normal operating conditions. This figure is up a half-billion gallons over the prior year. U.S. capacity represents more than half of global production capacity, which increased by 1.13 billion gallons last year, according to the Renewable Fuels Association. There are also several existing breakbulk trades in grain. Traditional bagged and palletized shipments to developing countries and remote markets persist, for now, according to Daniel B. Loughney, trade and business development director with the Port of Lake Charles, Louisiana. And there are finite but respectable markets for grain shipments moved in Gaylord bins, or in the proliferant super sacks and similar packaging. The Port of Portland, for one, has a robust bulk grain business. There are three elevators in Portland harbor, contributing to its ranking as the top U.S. wheat port. Sebastian Degens, director of marine marketing for the Port of Portland, said there has been a mini-grain infrastructure boom, with investments totaling US$500 million, by all seven terminal operators on both sides of Columbia River. Triggered by the deepening of the main port channel in 2010 from 40 to 43 feet, every grain operator has upgraded shiploaders, belts, and storage capability. Much of the project cargo destined for the grain terminals went unseen by public docks. Degens said some arrived by rail from domestic fabricators and were delivered right to the elevator site. "Because the elevators are on the water, what project cargo there was moved direct to terminal," he added. For Portland, the grain infrastructure improvements are already paying dividends. 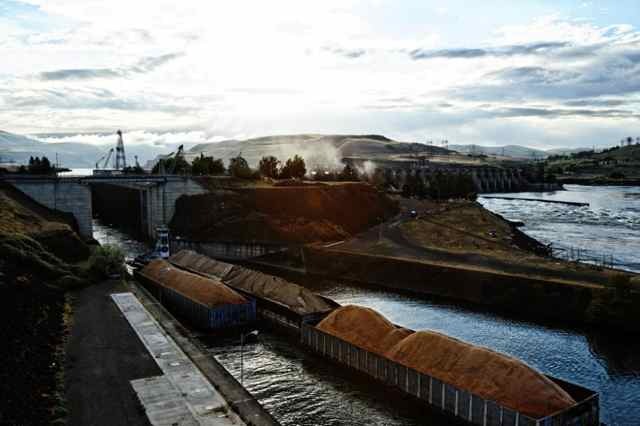 Between 2015 and 2016, Columbia River total grain volumes were up about 23 percent for wheat, soybeans and corn, according to Port of Portland statistics.